As most of the visible Universe is Hydrogen, the emission line for Hydrogen-Alpha is particularly prominent. 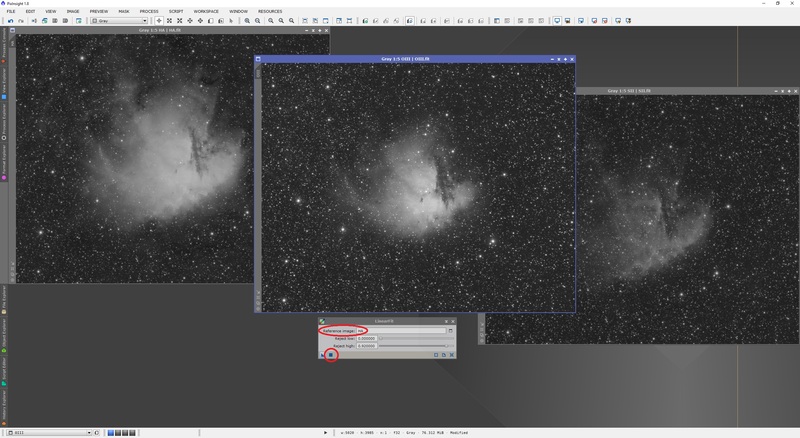 Astrophotographers producing monochrome narrowband images always choose Hydrogen-Alpha as a result. 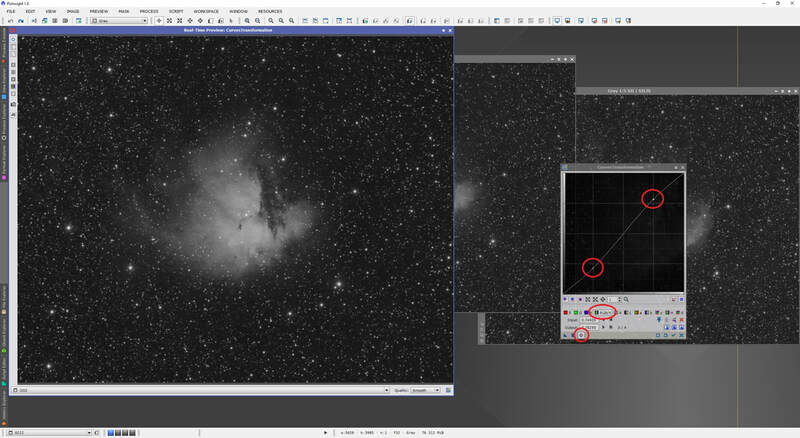 In the most part however, those pursuing narrowband imaging tend to capture images through multiple narrowband filters. These include Hydrogen-Alpha, Hydrogen-Beta, Nitrogen-II, Sulphur-II and Oxygen-III. The most popular of these are Hydrogen-Alpha, Sulphur-II and Oxygen-III, as these can be used to produce colour images of the likes produced by the Hubble Space Telescope, using the popular Hubble Palette. This tutorial is dedicated precisely to this palette and the variety in colour that one can really achieve using this palette. 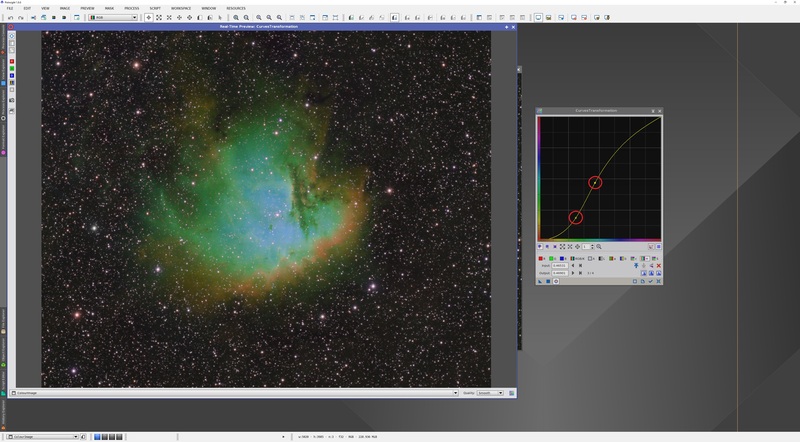 As with all colour narrowband images, astrophotographers exercise an artistic license when it comes to the final colour representation in their images. 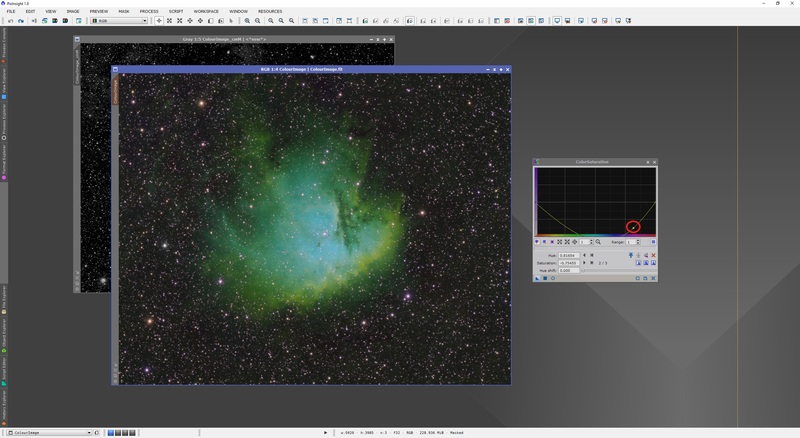 This tutorial explores various popular choices within the Hubble Palette​. Please note that due to strong similarities to the other narrowband tutorial, this one has some text in the first section that has been copied over. 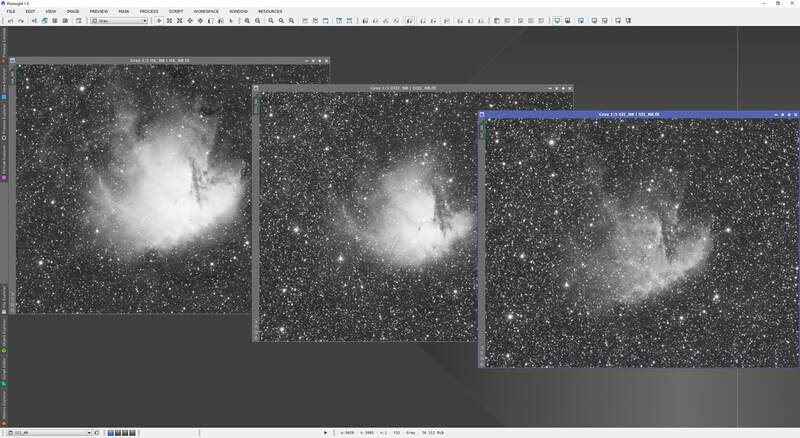 The above three autostretched images correspond to Hydrogen-Alpha (left), Oxygen-III (middle) and Sulphur-II ​(right). They have been fully pre-processed, have been registered with each other, have had background gradients removed with DynamicBackgroundExtraction and have been noise reduced with MultiscaleLinearTransform​. As aforementioned, in order to get the most out of colour combining these images, it is best they are stretched to non-linear. Since this is the subject of another tutorial, the procedure covering stretching the images to non-linear will not be covered in detail. I generally use either HistogramTransformation or MaskedStretch, or a combination of both (first MaskedStretch and then HistogramTransformation to tweak). 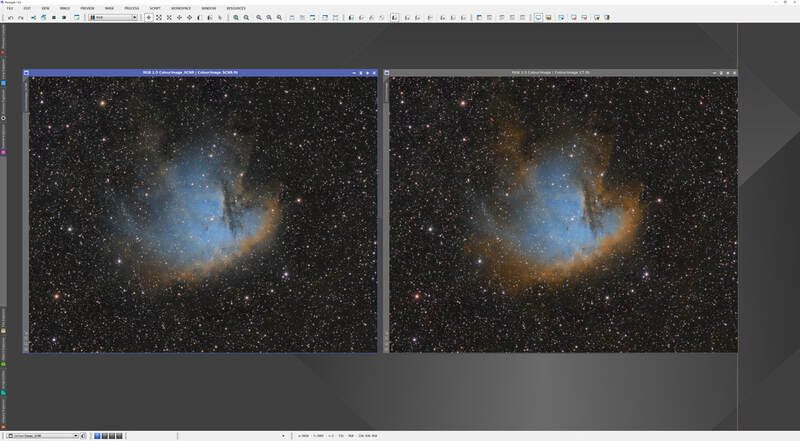 ​​​Having used the same settings in MaskedStretch (besides the Background reference image referring to each image's own background preview box), the background has been raised to the same brightness in both images. The trouble is that naturally, the Oxygen-III and Sulphur-II images' nebulosity is also less bright than Hydrogen-Alpha's and this means it will contribute less to the colour combination. 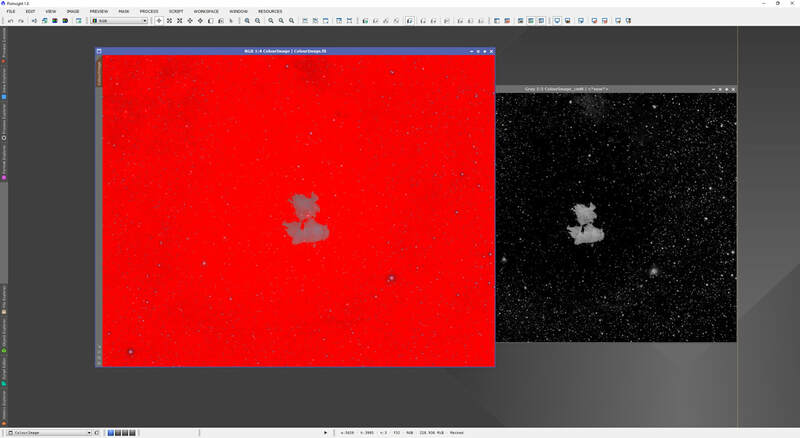 Though the final colour image can be tweaked significantly, if you are unhappy with the overall contribution from Oxygen-III and Sulphur-II, you can stretch them further using HistogramTransformation until you are happy. The Mean and Median pixel values for each image can be seen quickly using the Statistics process, selecting each image one by one. This can give you an idea of just how much brighter one image is over another. As is naturally the case for the vast majority of nebulae, the overall brightness is highest in Hydrogen-Alpha and lowest in Sulphur-II, with Oxygen-III being a bit in the middle. ​Nevertheless, in this particular case, all three images have comparable brightness and can contribute fairly toward a colour image. However, should you want to brighten one or more images, there are several options at hand. For manual tweaking, one can use HistogramTransformation or CurvesTransformation. Before starting to use either process, click to select the image you wish to tweak. For HistogramTransformation, one only needs to select the image in the process window, click the Real-Time Preview button and start moving the mid-tones slider to the left and the black-point slider to the right, until you achieve the desired level of contrast in the image. Small tweaks are generally good at this stage (since the images are already non-linear) and fairly comparable. 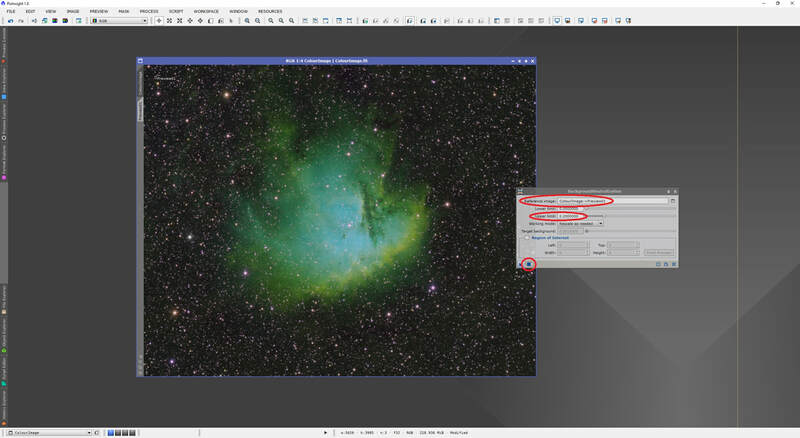 ​Either method is good for manually tweaking the image's overall brightness and contrast. You can use the Statistics process to check how they compare against each other after some tweaking, and perhaps use this measure to control how much you tweak each image. 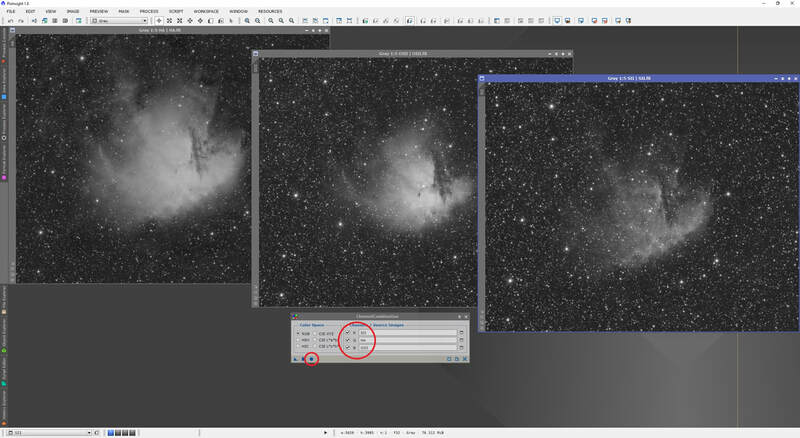 PixInsight has a process that can be used to equalise the images. This process is LinearFit. Despite its name, it works for both linear and non-linear images. Ironically it works slightly more effectively with non-linear images if what you want to achieve is essentially the same Mean and Median pixel values on your images. The LinearFit process is very simple. Simply select one of your images as the reference to match the others to and then apply the process to the other images. 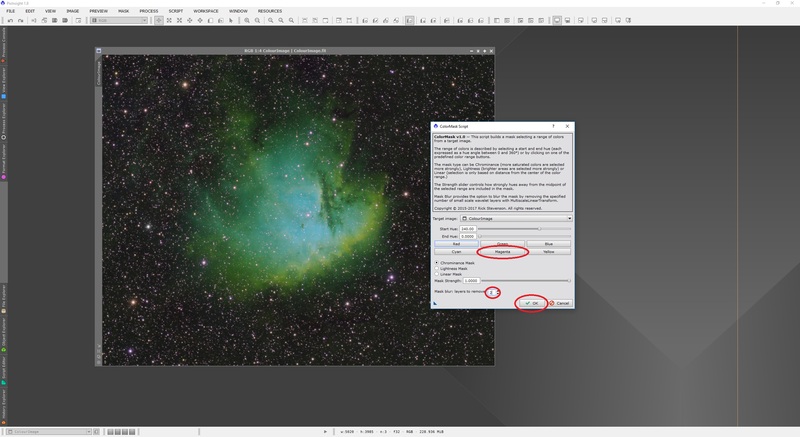 ​The one thing to be careful about when using LinearFit is that if your less bright images are significantly less bright than the brightest image that you happen to use as reference, it will produce a very noticeable brightness increase to the images you apply the process to. This may sound great but if your images are not very bright, it likely means you have low Signal-to-Noise Ratio (SNR) and therefore it will increase the level of noise as well. This will also brighten the background, giving your colour image a non-neutral background likely full of noise. One way around this, which is not necessarily ideal, is to use a lower brightness image as reference. This may not be ideal because it will essentially dampen the contrast on your higher brightness image(s) (e.g. Hydrogen-Alpha), which tend to provide much of the detail. ​As my images already have fairly comparable Mean and Median pixel values to start with, I simply applied LinearFit to Oxygen-III and Sulphur-II using Hydrogen-Alpha as my reference image. 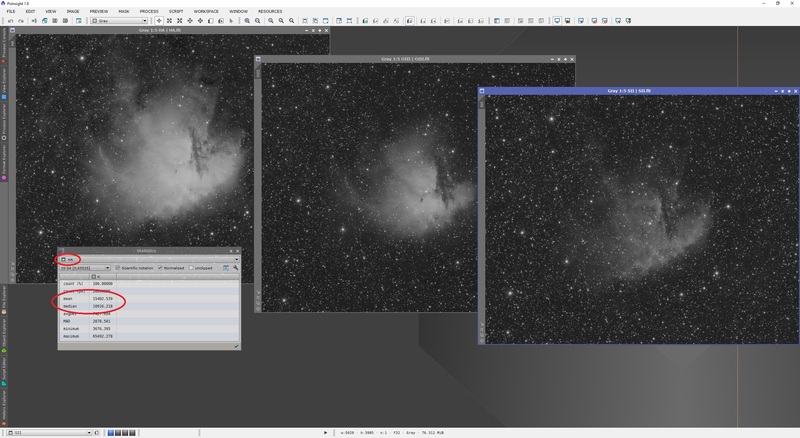 With the background and noise levels still under control, I opt to not tweak the brightness any further on any of the three images and proceed to colour-combine. ​Once selected, we click the circle Apply Global​ button to produce the new, colour image. 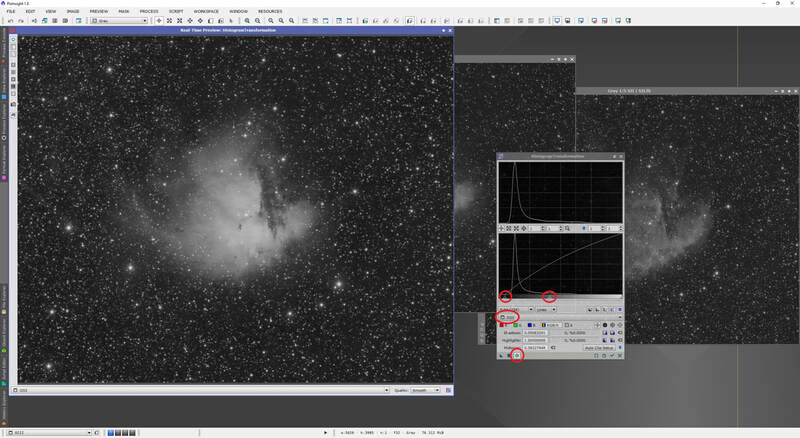 With the colour image produced, we can close the three monochrome narrowband images and the ChannelCombination process. Though the background in the image is fairly neutral, it is always a good idea to neutralise it manually. 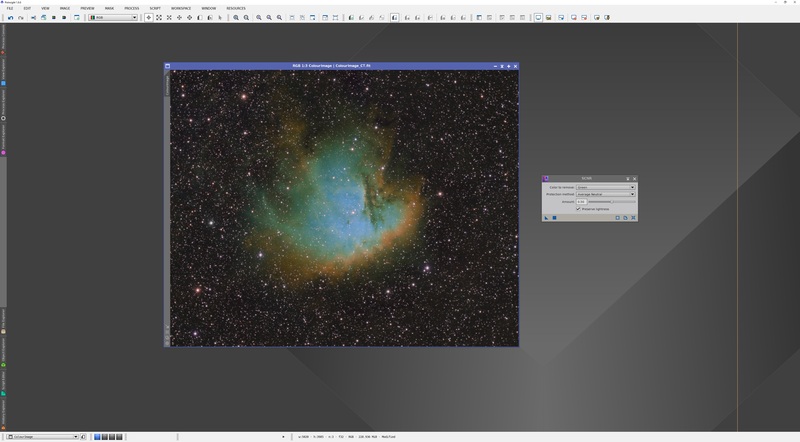 ​For this, we will use the BackgroundNeutralization process but we first need to create a small preview box encompassing an area that is essentially background (not nebulosity, not even faint). You can zoom in and pan around your image to identify such an area (it need not be very big). Once identified, click the New Preview Mode button on the PixInsight toolbar and drag to create said preview box in the background region identified. ​With the preview box created, because the image is non-linear, we will need to measure the maximum level found in the background. This is most accurately done using the Statistics process. In it, we can specifically select the preview box itself. It is best to then select Normalized Real [0,1] mode so that the values displayed are from 0 to 1 rather than pixel values. We simply need the value under maximum​. Looking at the values shown on maximum, it seems mine are 0.194 for Red, 0.175 for Green and 0.196 for Blue. We need not be exact as it is best to round up a bit so we will use 0.2. ​We now close the Statistics process and open the BackgroundNeutralization process. Here, we select the preview box as the Reference image, increase Upper limit to our maximum of 0.2 and then apply the process to the image. 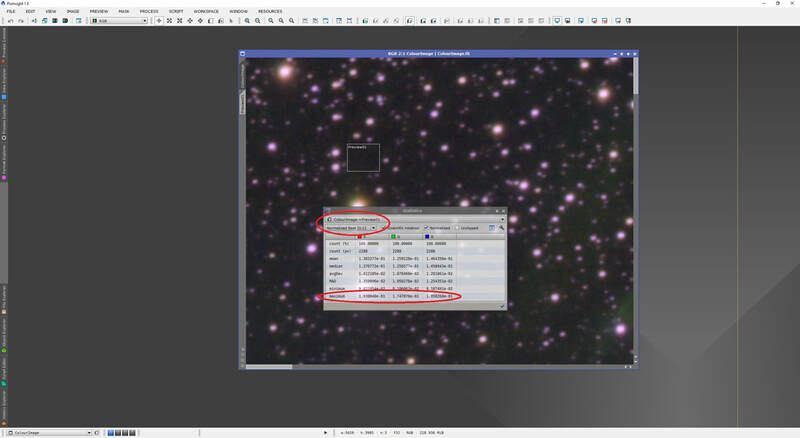 The BackgroundNeutralization process can now be closed and the preview box can be deleted by going through the PixInsight menus Preview -> Delete All. At this point we have a traditional Hubble Palette image. It is predominantly green because the Hydrogen-Alpha signal tends to be so much stronger than Oxygen-III and Sulphur-II. Most of the stars are also magenta. If you are a purist and the Hubble Palette is truly what you want to achieve, you can now continue post-processing the image as normal as the colour-combination is done. 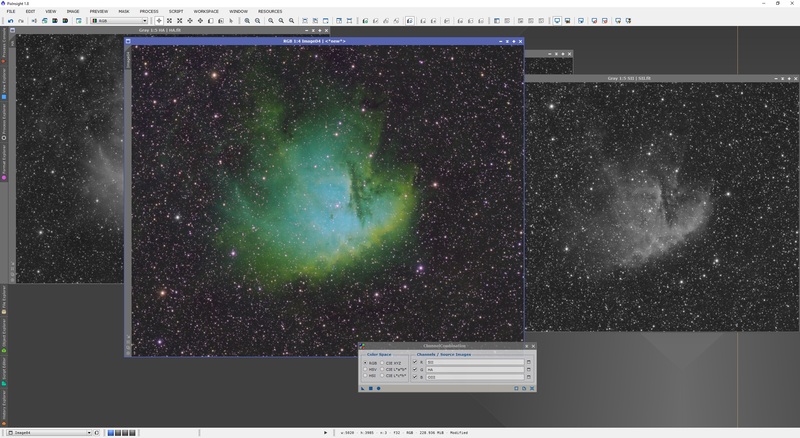 A lot of astrophotographers however, make changes to the palette after colour-combining. Some changes made are subtle and some are very pronounced. A common palette change is to make the blues deeper and change the greens to reds/oranges. It is also common to alter the star colours to remove their magenta tone. The following sections deal with these common changes. 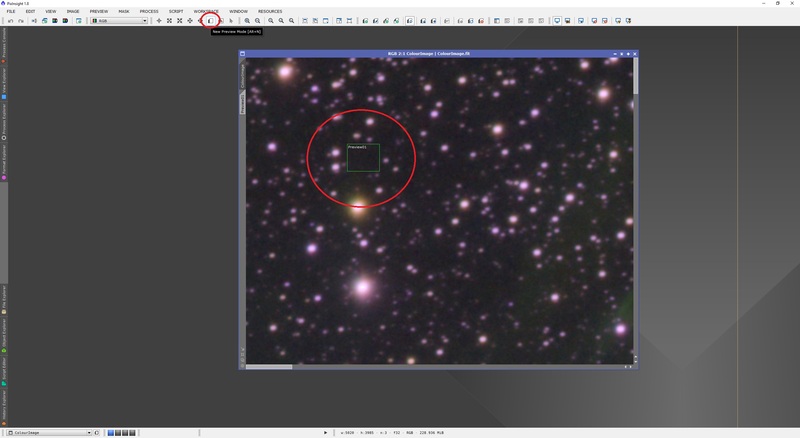 To reduce the stars' magenta tone, we first need to select the problematic areas of our image. Thankfully, we have the ColorMask script we can use to quickly target these areas. This script is found under the menus Script -> Utilities -> ColorMask. 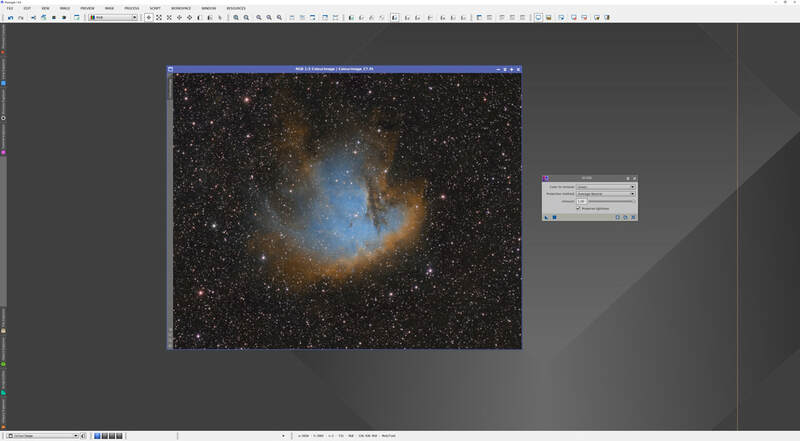 Once the script is opened with your colour image selected, click the Magenta button and set Mask blur: layers to remove to 2 (this will smooth the mask a little bit), then click OK​. The mask image produced is one that specifically targets areas of the image with a magenta tone. 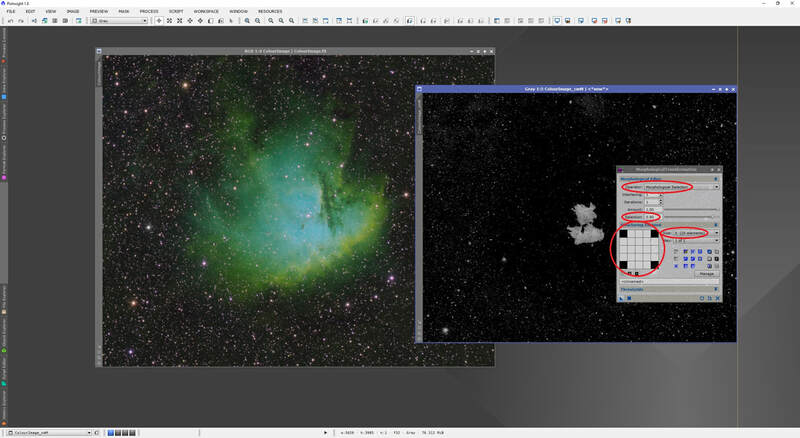 Sometimes however, there is a small halo around stars left out of the mask image, so it is generally a good idea to dilate the mask a little bit in order to include these areas. For this, we will use the MorphologicalTransformation​ process. ​Once open, select Morphological Selection under Operator, set Selection to 0.90, select 5 (25 elements) under Size and then click the black squares under Structuring Element to give it a kind of star shape (as shown below). If you make a mistake, hold the CTRL key and click a white square to turn it black. Worthy of note at this point is that Morphological Selection is a combination of dilation and erosion, producing a smooth result than using just one of those. Increasing Selection above 0.50 will dilate more than erode and decreasing Selection below 0.50 will erode more than dilate. We wish to dilate so 0.90 works well. Once set as above, apply the process to the mask image and close the process window. The mask image can now be applied to our image. To do this, click to select the colour image and then go to the menus Mask -> Select Mask (or press CTRL M on your keyboard). Select the mask image from the list and click OK. Once applied, your colour image will likely turn almost completely red. This shows the mask is protecting everything except the magenta areas. We can hide the mask through the menus Mask -> Show Mask (or press CTRL K on your keyboard). This will keep the mask active but hidden so we can actually see our image. To reduce the colour saturation on magenta, we simply click the flat line to create a point in the middle of the purples and drag this point down. You will notice adjacent areas on the flat line curve downwards as well, but we need these colours to stay unaltered. To prevent these colours on the spectrum being altered as well, we click to create more points in order to flatten the curve everywhere except around the purples. The procedure is to first create a point on either side of the purples (the start and end, so to speak) and then if the rest of the line is still not flat, click to create points there (above/below the peaks) as well to flatten it. Flattening the line completely is difficult using a mouse or trackpad, so you can simply use the left and right arrow buttons on the ColorSaturation window to select each point individually and set Saturation to 0.00000 on all those points that are meant to flatten the line. Above, I have selected the point to reduce the purples' colour saturation and manually set its value to -1.00000. Once set up as above, we can apply the process to the colour image. I tend to apply this three times or so. Below we can see the before (top image) and after (bottom image) for an area with lots of magenta stars. The difference in the strength of the magenta tone of the stars is very noticeable. 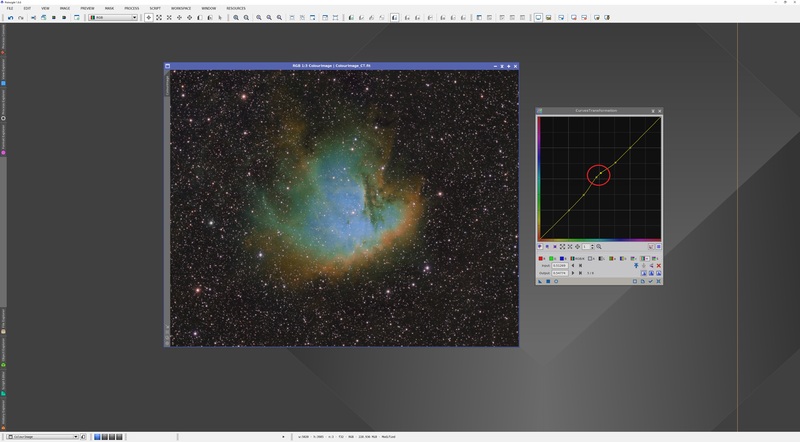 Of course, it can be reduced further by being more aggressive on ​ColorSaturation with the value on Saturation on the purples, or by applying the process a few more times, or by ensuring the mask image is a bit more dilated to encompass larger areas around your stars. What I normally do not recommend doing is using the CurvesTransformation process in Saturation mode to strongly reduce all colour saturation in selected magenta areas. The reason for this is that the mask image tends to select areas of your image that do not look magenta but have some magenta in them (in my case, the core of the nebula). As you can imagine, removing all colour saturation in these areas is not going to produce a very pleasing result. Because of this, I always use the ColorSaturation process as described above instead. Once happy with the result, we can close the ColorSaturation process and remove the mask image using the menus Mask -> Remove Mask and then close the mask image without saving as we no longer need it. 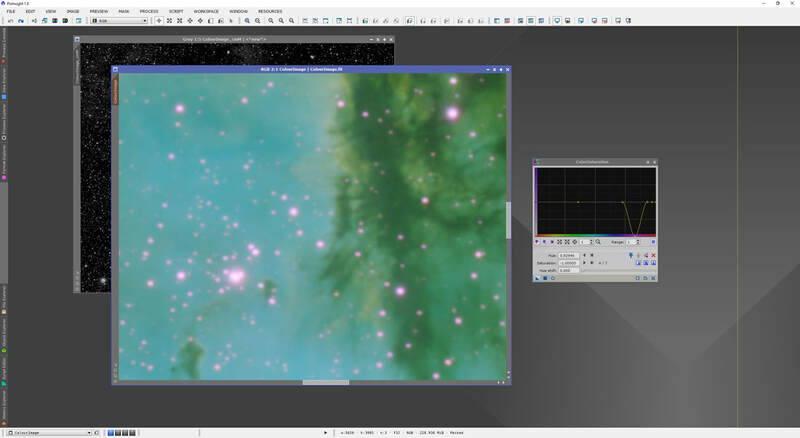 Again, if you are a purist with the Hubble Palette and would like to keep the colour palette as it is, with the reduced magenta tone on the stars, then ​​​you are done at this point. 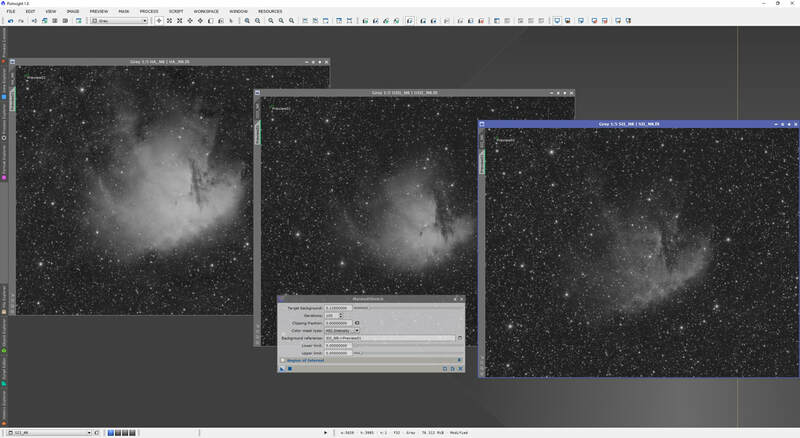 However, it is common for astrophotographers to take their own artistic license with the Hubble Palette and make changes to the colour palette. This is covered in detail in the next section. ​Arguably, Photoshop's Selective Color tool ​is actually faster at performing the colour palette changes, but because this is a PixInsight tutorial, we will concentrate on how to do it there. I must admit however that at times, I have saved the colour-combined image as a 16-bit TIFF, opened it in Photoshop, made the colour palette changes, saved and then re-opened in PixInsight​ to continue post-processing. The tools we will use in PixInsight are the CurvesTransformation and SCNR processes. A typical Hubble Palette version is one that is orange and blue, sometimes with hints of green. The SCNR process can be used to reach this point immediately, though not with as good results as we can reach with some more effort. ​To quickly reach an orange-blue palette, we can simply use default settings on SCNR. That is, with Green selected as Colour to remove, with Average Neutral as Protection method, with 1.00 as Amount and Preserve lightness enabled. Amount set to 1.00 ensures that the end result is the completely the processed image (e.g. 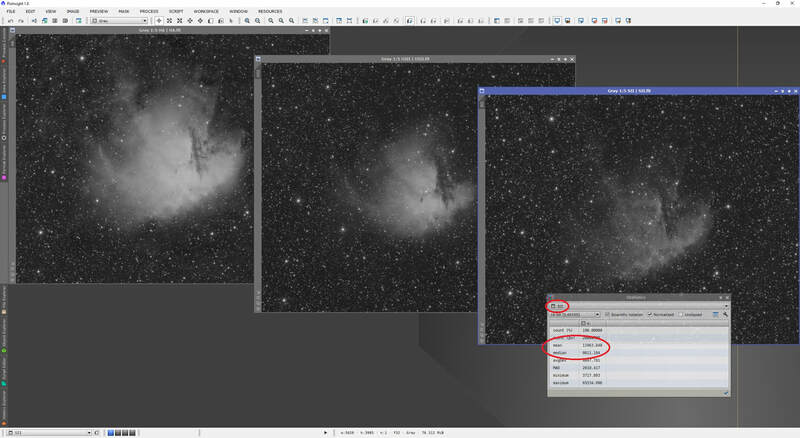 if we set 0.50, the end result would be a combination of half the original image and half the processed image). Preserve lightness is important to leave enabled as otherwise the green areas will become extremely washed out. Though your end result from this may be pleasing and you may be happy to proceed with further post-processing, we can actually achieve a brighter and more detailed end result from using CurvesTransformation. SCNR, in its Average Neutral mode, will calculate an average of the Red and Blue values of pixels and replace Green pixels with this average if the average of Red and Blue is lower than the Green. This is mostly visible in predominantly green areas of your image, and therefore these green areas are replaced with an average of the red and blue present in those areas, which because green is the dominant (brighter) colour, ends up making the image look a little washed out in previously green areas. We will use CurvesTransformation in Hue mode to shift colours closer to what we would like to achieve, thus altering the pixel values to a point that the green areas are more red and blue than before application. This means that when we apply SCNR later, the effect of washing out the image in predominantly green areas is less destructive. Enabling the Real-Time Preview window is a good idea while tweaking. ​​To get closer to the orange-blue palette we want, we simply click to create two points on the Hue curve. The precise location of these two points varies from image to image but I find that roughly where they are shown below is a good compromise for most images. The hue shift generated by creating these two points on the Hue curve has the effect of making the reds and blues more intense, while de-emphasising ​the greens a little. It ends up giving the image more of a tri-colour palette, which you may indeed prefer to end with as-is. Once happy, apply changes and close the Real-Time Preview​ window. ​If you are happy with your image, you may stop here and continue with other post-processing. 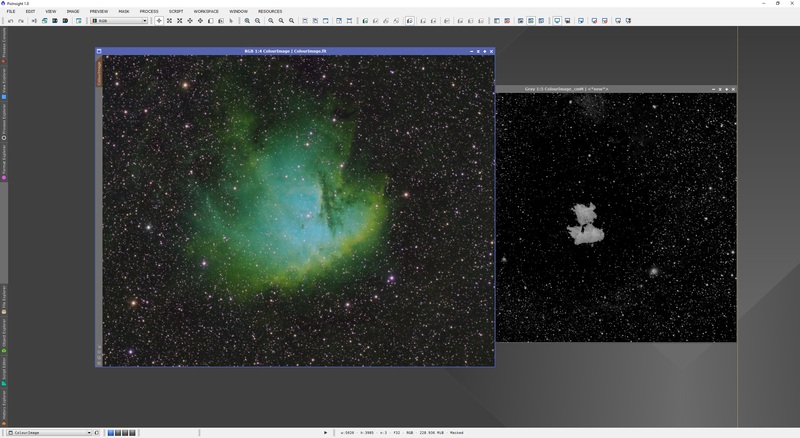 We can however tweak the amount of green in the image using SCNR as we did before. If you are happy with removing all traces of green from the image, you can simply apply SCNR precisely as we did before - in its default settings with Amount set to 1.00​. Indeed this is significantly better than by just using SCNR without using CurvesTransformation​ prior. ​Below is a comparison of the original attempt at using SCNR and the new attempt above (CurvesTransformation followed by SCNR​). The left image is the original attempt and the right image is the new attempt. There is a very noticeable increase in brightness, detail and depth, making the use of a CurvesTransformation hue shift prior to application of SCNR a definite choice. ​Of course, if you choose to leave some green in the image, you may lower Amount in SCNR for its application. For example, a value of Amount of 0.50​ leads to the following result. ​For fans of a tri-colour Hubble Palette that prioritises orange-blue, this is a good choice. Experimentation with different values of Amount is key to achieving the desired result at this point. The higher the value of Amount​, the less green there will be in your image. One may also choose to then play with a smaller hue shift to tweak the modified colour palette to perfection​. For example, to deepen the blues a little bit, one can perform a small hue shift as follows. ​This involves creating points along the hue curve that ensures the line is straight except a little bump is produced half-way up that curves the line upwards, only a little. This pushes the light blue to a darker tone. The same hue shift can be applied to an image without any green. 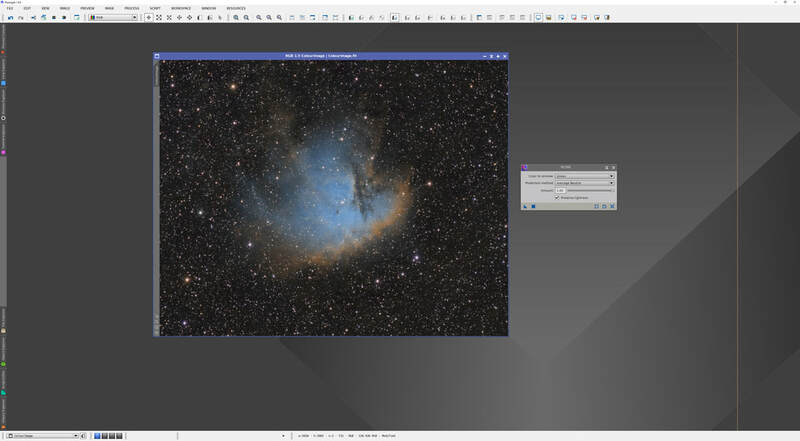 When you have reached a point that you are happy with your Hubble Palette image, you can then proceed to perform all other post-processing you may want, such as feature and contrast enhancements. These techniques are all subjects of other tutorials.